I love cake. There’s just something about it that turns the most ordinary meal into a celebration. A cake holds much more meaning than just a sweet dessert. A pie? Well, that’s a labour of love and one should always be appreciative of a homemade pie. A cupcake? It’s sweet, it’s cute and fun and will most certainly put a smile on any face. But a cake is more than all of that. It’s impressive in stature and tone. It holds memories of birthdays and weddings past. It is love and grace blended with silk ribbons and lace. Cake might seem to be fussy but it doesn’t have to be. This lemon yogurt cake comes from Orangette and is itself filled with its own memories and Kodak moments, but this cake is as simple as they come. I made this a couple of weekends ago for my buddy, Charlie’s first birthday. Even though I overbaked it, it still managed to garner a few oohs and ahhs. I tried again the following weekend for my mother-in-law’s birthday and it baked up to perfection. I soaked the cake with a lemon syrup rather than Orangette’s lemon glaze and then topped the cake with freshly whipped cream and strawberries. It was light and fresh and celebratory. It was perfect. 1. Preheat oven to 350. In a large bowl combine the yogurt, sugar and eggs and mix well. In a seperate bowl, mix together the flour, baking powder and lemon zest. Add flour mixture in with the yogurt mixture and blend. Add in the lemon juice and oil and stir until everything is all mixed and blendy. 2. Pour batter into a greased & floured 9 inch round cake pan. Bake for 30-35 minutes or until the top is golden and a cake tester comes out clean. Remember, don’t over bake!! 3. Cool cake on a rack for 20 minutes and then turn out on a rack to cool completely. In a small bowl, combine the sugar and lemon juice until it tastes like the kind of syrup you make lemonade with. When cake is cool spoon over the lemon syrup and if you have any extra just pop it in a class of cold water and you’ll have lemonade to boot! I agree. I love cake. But not just any cake. It has to have some oompf – and this cake does! I enjoy celebration cakes the most especially because I’m a fan of frosting, icing and decorations. This cake looks so good! Definitely one to try! Cake is my favourite food. Even cake without icing. I love cake. YUMMY. Thanks, by the way, for consistently great posts…I’m a regular reader! cake, what’s not to love…right judy? i also don’t need icing to enjoy cake! thanks larissa for stopping by! Oh my, this looks phenomenal! I’m going to have to try it very soon – especially as the warm weather is finally coming back. Can I ask, though, what the white topping is in the photo? Yogurt, icing? Looks wonderful. anon, i used freshly whipped cream for the topping. I made the cake to take to a natural dyeing workshop yesterday – the workshop went down well, and the cake even better! India, glad the workshop and the cake went well! I’m always excited to hear how things turn out for others. Mmmh, that looks good. I love cakes with yoghurt! I too love cake and believe that cute little cupcakes (that are all the rage) do not nearly measure up to a proud, layered cake. This recipes looks great. I just made some limoncello, which would probably be another great thing to soak it with. Thank you for your thoughtful post and cake glorification! i agree, cake is special. this lemon cake looks & sounds fantastic, esp for a lemon-loving lady like myself! and lemon is really a perfect flavor for spring/summer. kickpleat, you are expert at eating seasonally! i guess it’s somewhat intutitive & convenient (to eat foods that are in season)…but you have a talent for capturing that in words & pictures. for that reason, i love coming here and finding that so much of what you make and share here is just right for the season. Stunning looking cake! It’s just how I like it, dense and substantial! 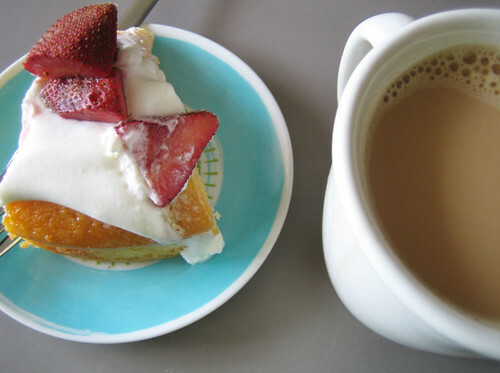 Love all the cream, icing and strawberries! Judy, your just a fast person who loves cake in the same manner as i do…. im sry, i was jk…. cake is really a good food.. I made this last night for a party and people said it was good! I turned it into a strawberry yogurt cake instead of lemon because I didn’t have any. I also made cream cheese frosting for this. I was a little disappointed in its mild sweetness but only because we are a bunch of students and I thought that people might prefer sweeter things than this. I might add a bit more sugar next time, though the level of sweetness actually suits me personally. 🙂 I tried sifting the flour and baking powder in measuring them out to hopefully make the cake lighter in texture, but it didn’t really work. It wasn’t too dense though. Overall it was delicious, I think. Thank you for sharing the recipe, Jeannette! 🙂 I will be making this again in the future! I threw fresh cranberries in this and substituted the yogurt with fromage blanc–I guess a bit like plain greek yogurt? I would venture to say that it came out too moist (might have been the lemon syrup I put on…I think I overdid it), so I’m trying it with whole wheat flour this time. I think it can handle it. My husband has requested it on repeat for his birthday cake and claims its his favorite baked good ever–and for sitting up on that kind of pedestal, it’s a really easy cake to make! Thanks for the recipe!